the Level You Have Always Dreamed of? Most Sales Professionals never make the sales they can because their presentations are only geared to about 25% of the people they focus on. Most business owners fail to grow their businesses because they don't understand and connect with the people working for them. Business owners don't know how to communicate with those working for them and have them do work in line with their talents and passion. Most sales professionals normally try to sell their product or service in the way they would like it to be sold to. Unfortunately only 25% of people like to be sold in that way. They may not be making a sale to 75% of the prospects they call on because they are not hitting the right buttons in their sales presentations. Business Owners have one additional problem. That is their employees. They don't communicate to their employees in a way they understand. They also have no way of determining what work each employee can do best and frequently place them in jobs where their talents are being wasted. 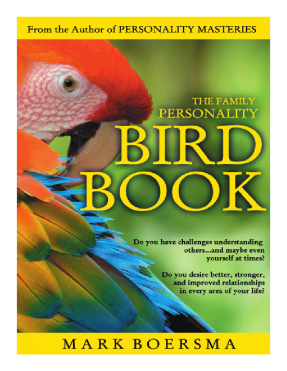 By reading the Family Personality Bird Book and becoming familiar with the four Personality Styles you will learn about, you will understand how to identify how each of your prospects want to be sold. You can gear your presentations to that. Your sales will increase. If you are a business owner you will understand how to identify the Personality Styles of each of your employees. You will see how to communicate with them effectively. You will also be able to help them identify the work they are best able to do for you.